Kidney, Renal tubule - Dilation in a male B6C3F1 mouse from a chronic study. Dilated tubules are noted as tracts running through the cortex and outer medulla. 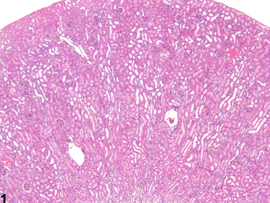 Kidney, Renal tubule - Dilation in a male F344/N rat from a chronic study. Tubule dilation is present throughout the outer stripe of the outer medulla, extending into the cortex. 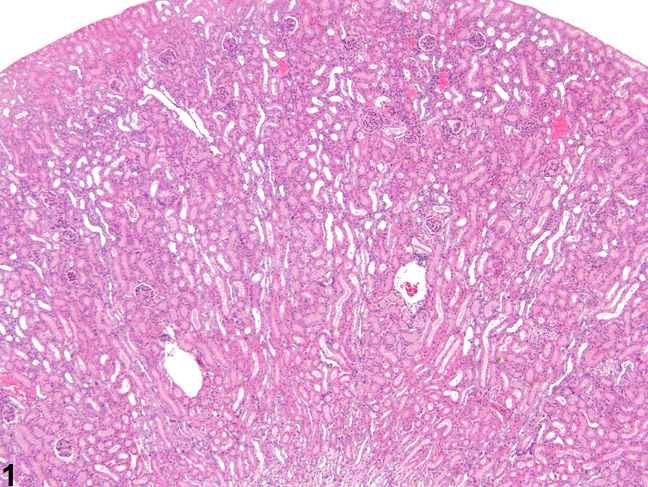 Kidney, Renal tubule - Dilation in a male B6C3F1 mouse from a chronic study. 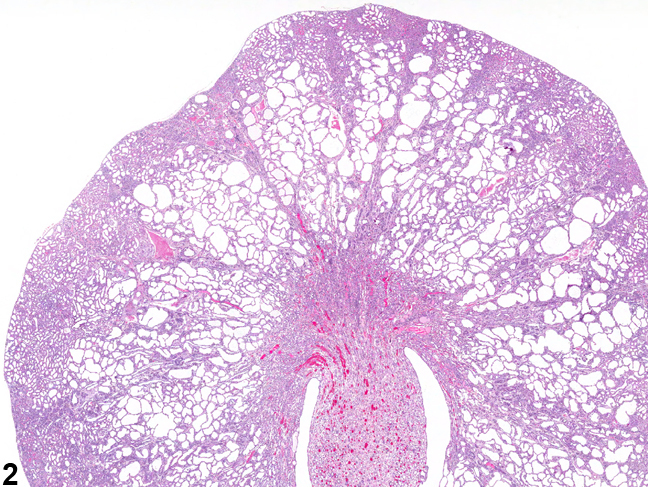 Slight tubule dilation is associated with degeneration and necrosis. 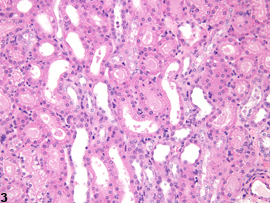 Kidney, Renal tubule - Dilation in a male F344/N rat from a chronic study. Tubule dilation is associated with chronic progressive nephropathy. Renal tubule dilation may occur anywhere along the nephron or collecting duct system. It may occur in focal areas or as tracts running along the entire length of kidney sections ( Figure 1 ). 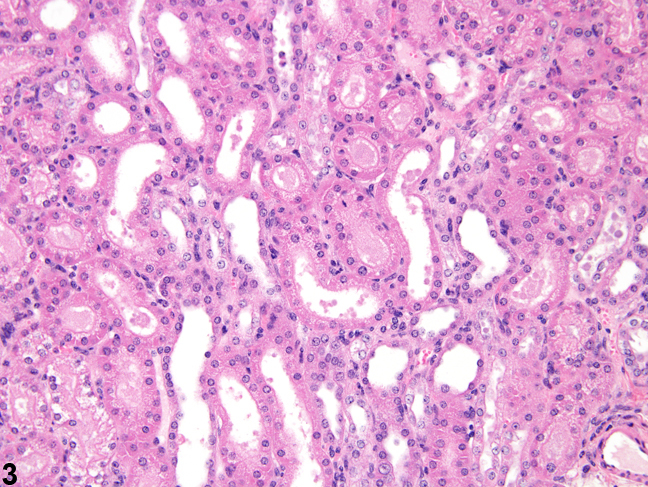 Renal tubule dilation may occur from xenobiotic administration, secondary mechanisms, or an unknown pathogenesis (see Kidney - Nephropathy, Obstructive) ( Figure 2 ). Dilation may result from direct toxic injury to the tubule epithelium interfering with absorption and secretion ( Figure 3 ). It may also occur secondary to renal ischemia or from prolonged diuresis related to drug administration. Secondary mechanisms of tubule dilation may result from lower urinary tract obstruction, the deposition of tubule crystals, interstitial inflammation and/or fibrosis, and chronic progressive nephropathy ( Figure 4 ). 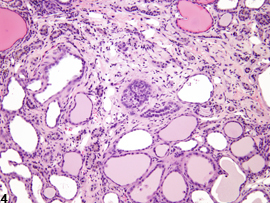 A few dilated tubules may be regarded as normal histologic variation. Renal tubule dilation should be diagnosed and given a severity grade. The location of tubule dilation should be included in the diagnosis as a site modifier. 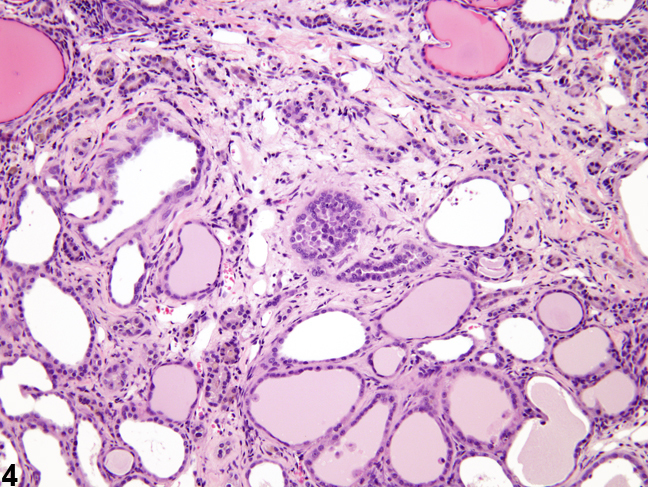 The pathologist should use his or her judgment in deciding whether or not secondary tubule dilation is prominent enough to warrant a separate diagnosis. Greaves P. 2012. Histopathology of Preclinical Toxicity Studies, 4th ed. Elsevier, Amsterdam, 560. Lameire N. 2005. The pathophysiology of acute renal failure. Crit Care Clinics 21:197-210.